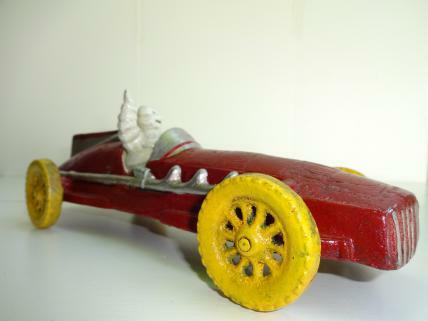 This cast iron Michelin Man Figure is in a Red Racing Car. With the racer hand-painted in red, silver and yellow, this cast iron figure would look good in any garage, workshop or office. The Michelin Man (sometimes also known as Bibendum) is finished in his customary white colour and is happily waving to his fans. The figure weighs in at a sturdy-feeling 1.4kgs and benefits from an authentic scuffed vintage-style look.